A person walks near the entrance to a Toys R Us store, in Wayne, New Jersey, Jan. 24, 2018. A group of investors is planning a potential comeback for Geoffrey the giraffe and his crew. 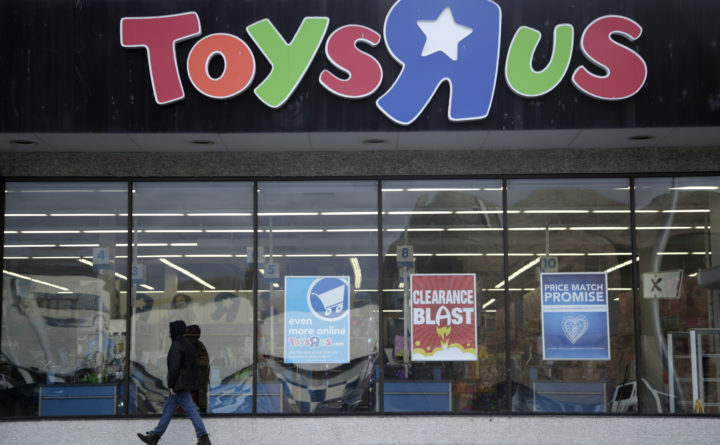 Investors that control the assets of the company say they now see a better chance of a return on investment by potentially reviving the toy chain, rather than selling it off for parts. The remnant of Toys “R” Us Inc. is looking for licensing partners to revive the brand in several parts of the world, including in the U.S. by next Christmas. Toys “R” Us liquidated its operations in the U.S., U.K., Australia and other regions last year after failing to emerge from bankruptcy. But units in other markets, like Asia, remained in business and they still pay royalties to and buy private-label goods from Tru Kids, essentially a licensor of brands. The remaining parts of the business generated $3 billion in retail sales last year. Tru Kids is now looking for partners to re-establish the company’s brands in markets that liquidated. The re-emergence of Toys “R” Us and Babies “R” Us in the markets it left could take many forms, including stand-alone stores, pop-up shops inside other stores or e-commerce, Barry said. The overarching goal is to create stores that mix online, offline and experiences — a target that its predecessor was faulted for falling short on, he said.